I am not selling products; I am offering the opportunity to directly support a poor family in Peru every time you buy something. With every purchase you are saying YES to an artisan interested in keeping his or her lifestyle; you are saying YES to that single mother trying to make a living while taking care of her children, you are saying YES to all of them when you choose to buy fair trade. My family recently received three wonderful products from Inca Kids made from 100% alpaca wool or 100% Peruvian cotton and eco-friendly color dyes. These handmade goods are made from artisans. 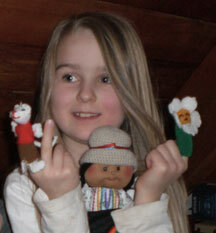 The finger puppets are a big hit with my children, who immediately got out the puppet theater and put on a grand show when they arrived. My three-year-old son, who hates to wear hats, loves his Inca Kids hat! My daughter is enamored with her Cholita doll (thank goodness it’s not a Disney Princess) and wants to ask our Peruvian friend Cecilia if she has a dress like the doll’s. She took Cholita to school to show her first grade class, which prompted a discussion at home about Peru, fair trade, and the Incas in preparation. I like my children’s toys to be unique and handmade. By supporting artisans and not large toy corporations, I am living more sustainably and teaching my children to appreciate human crafts. Inca Kids bridges that gap between the artisans in Peru and my family’s green values. Although I find it hard that your Peruvian friend has a dress like the “Cholita” many people still dress like that every day in our country! During July, the schools prepare special performances highlighting traditional dances of different regions in Peru and most of the kids participating do get to wear a dress like that (or similar) for at least a day.